Dave joined ASAE’s Reggie Henry and Rockbridge Associates’ Charles Colby for this session at the ASAE Annual Meeting & Expo in Salt Lake City. This braintrust trio provided updates and insights on ASAE Foundation’s Technology Success Study (which DelCor helped initiate and continues to support, and for which Rockbridge is the research provider). But it was the Q&A that opened the floor to some powerful and thought-provoking discussion. Data doesn’t lie—association members and staff have fewer technology Hesitators and Avoiders than the general population! How can that be? 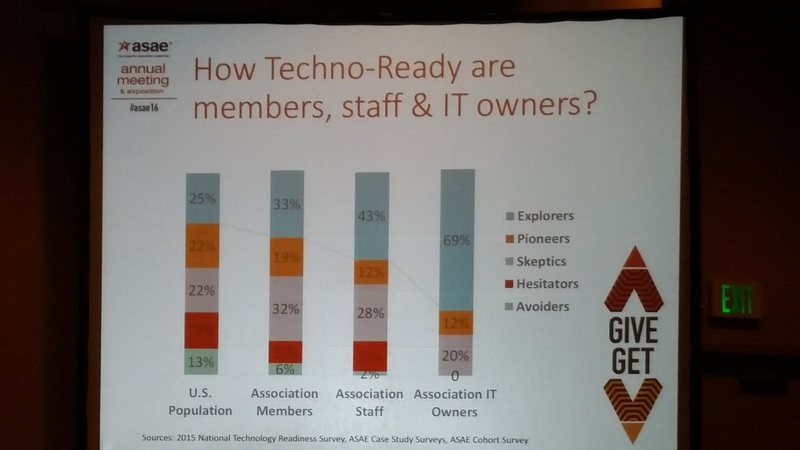 So, are associations deploying technology systems and products their staff and members find valuable? There’s no sweeping answer to that question—you have to assess your own IT maturity to determine whether you’re innovating or lagging behind. Another topic of discussion was the rise of the digital organization. I confess, I’ve been reading a lot about this in recent months, and I still don’t fully get it. (Cut me some slack—I’m a marketer, not a technologist!) As this concept becomes clearer to me, what emerges is a new approach that blends strategy, culture, and operations to impact relationships—primarily constituent relationships, but also an organization’s own ability to run both efficiently and innovatively. For those who still think digital = online, you might be slipping behind the curve. Digital doesn’t just impact your website or mean PDFing everything to make it accessible—it’s a new way of doing business. What does this new digital perspective mean? In her reflections on the session, YourMembership’s Peggy Smith described a simple but evocative real-life example of a digitally disconnected organization. Her story rings painfully true: organizations that don’t start thinking ahead, connecting the dots, and working toward IT maturity in their data, management, network, and digital frontiers will get dinged. You must assume that ‘meeting expectations’ is no longer enough. Does Your Organization Measure Up? The research team unveiled an action-oriented assessment tool designed to help association executives self-evaluate your organization’s IT maturity (based in part on DelCor’s IT Maturity Model) and tech-readiness in the context of your goals for overall success—your mission, vision, and business objectives. To see where you stand, take ASAE Foundation’s IT Maturity Mini-Survey.